—The new U.S. Bank Stadium in Minneapolis is one of the few sporting venues where spectators can not only watch the action on the field and on video screens, but also see how that action gets from the field to those screens. —Professional network administrators are rightly concerned with the security of the networks they operate, but IT involvement in AV projects is sometimes seen as increasing project effort and complexity with no functional benefit. 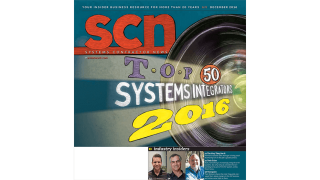 —The Annual Top 50 list is a flagship offering of SCN that dates back more than a decade. See who made the cut in this year's addition of our one-of-a-kind industry resource, along with commentary and selection of interesting projects from leading firms. —Like a finer pixel pitch, 2017 will be a year of refinement. Not strictly from an "evolution rather than revolution" standpoint, but more in terms of specialized quality enhancement. —If some Fortune 500 technology company just bought an AV manufacturer, or if a private equity firm purchased your rival, does either event actually affect you in a business sense? Rarely does a week go by without a business owner expressing concern because he or she heard about a merger in their business space and wonders what it means.